PERFECT BLUE SKY is a psychedelic, classic rock band hailing from Stockholm, Sweden. 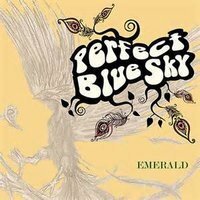 PERFECT BLUE SKY released their latest full-length effort titled "Emerald" on March 23rd, 2015 via Scarecrow Records. PERFECT BLUE SKY is largely inspired by a variety of 1960s and 1970s classic rock bands. Many popular artists have come on various records to sing and play instruments with the PERFECT BLUE SKY duo. The first track titled "Phoenix Starlight" begins the album with soft acoustic guitars, and a background that sounds like a rolling ocean crashing onto the shore. The serene, acoustic sound of the music really speaks to the human spirit and soul. Many other tracks include such calming, peaceful sounds to them as well including "Kingdom" and "Bend Your Sky" to name a couple. The entire album really talks about uplifting things like moving on in life after things go wrong in "Phoenix Starlight", or realizing that happiness in life comes in small things and not necessarily in all of life's total circumstances in "Bend Your Sky". It reminds us that humanity always finds a way to endure, and that things in life are beautiful, no matter what good or bad times you are personally going through. Things always get better. The human spirit has to remember to keep going through it all. We can get through things we wouldn't ever imagine if we just decide that we want to live life to it's fullest. Between the uplifting lyrics and the powerful messages as well as the great beat and sound that really speak to the human spirit, mind, and soul PERFECT BLUE SKY fit their name well. While sometimes life is far from perfect, we remember that we can create our own world that has a PERFECT BLUE SKY shining over it all the time if we choose the right attitudes in life, and choose to live to its fullest the beautiful lives that we are given.